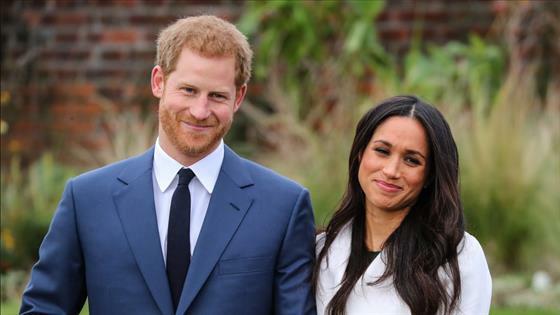 Meghan Markle and Prince Harry were back in wedding mode less than a month after tying the knot, attending the nuptials of his cousin, where the Duchess of Sussex narrowly avoided a fall. On Saturday, Lady Celia McCorquodale, daughter of Lady Sarah McCorquodale, sister of Harry's late mother, Princess Diana, wed George Woodhouse at St Andrew and St Mary's Church in Stoke Rockford, Lincolnshire. Meghan wore a $5,490 white and blue floral, long sleeve, asymmetrical Oscar de la Renta Resort 2019 wrap cocktail dress, white pumps and a white fascinator and wore her hair in a messy bun—her signature style. Harry sported a black jacket, gray pinstriped pants, a khaki vest, a light blue shirt and a cornflower blue tie. As they walked through the grounds of the church, Meghan appeared to slip on the grass and stumble momentarily while holding Harry's hand. She recovered quickly as Harry led her and helped her keep her balance. Footage of the near-tumble was posted by the Daily Mail. Celia wore a white lace half-sleeve wedding dress and the Spencer family diamond tiara that Diana wore to her wedding to Harry's father Prince Charles in 1981. Celia had attended Meghan and Harry's royal wedding at St George's Chapel in Windsor on May 19. This marks Meghan's fourth public outing since she and Harry tied the knot. Last week, she stepped out with Queen Elizabeth II in Cheshire, England for their first solo joint engagement.